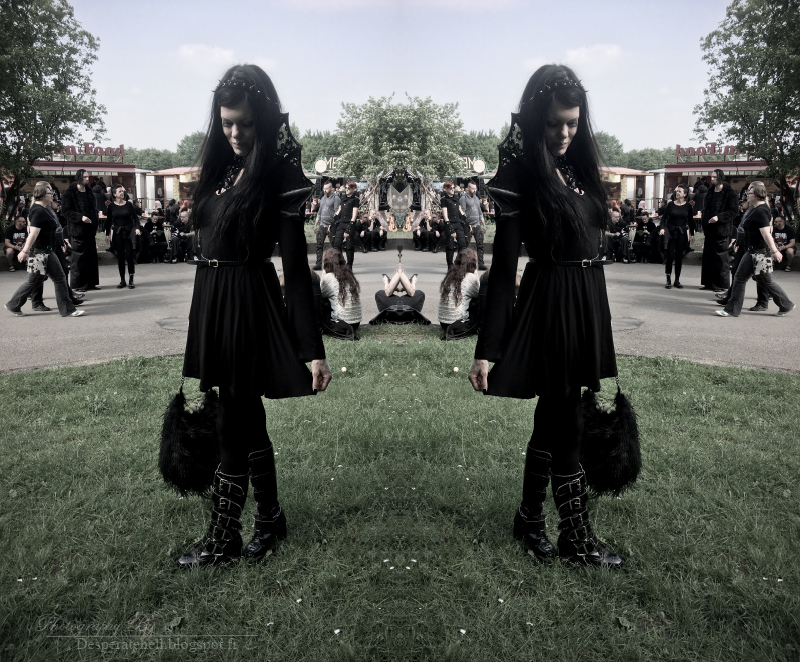 It really seems that I have lost my track of time, but here comes the next Wave Gotik Treffen post which at this time is short. Like I already mentioned I didn't think of my outfits much in advance and this next outfit was created quickly in the morning when I explored the contents of suitcase and I had a feeling that I want to wear something comfy. A stretch dress and self made lace collar pleased my eyes and in addition I added a self made hair band, fluffy bag (which I found in the flea market and I fell in love with it during the journey) and Pennangalan boots. All in all quite simple, but enough splashy to my taste and I prospered in this look really well. If I think this look this is something that I wore already fifteen years ago. I had the similar fluffy bag back then, I loved buckle boots and I wore rivet accessories. Some things never change. Even the hair looks same. On the second day we ended up watching Zeromancer, Oomph! and Front Line Assembly. All were great, but Front Line Assembly was the best. They visited my hometown some years ago, but I missed the gig due to the economic reason, but now I had a chance to see them and it was worth it. With all my heart I could see them again. Kaunis asu! Näyttävä, mutta samalla varmasti niin mukava että jaksaa vaikka koko päivän ilman sen kummempia tuskastumisia.